Want to Take a Spin with Our Featured Game? It’s Hillbillies Cashola! Are you ready for a hootin’, hollerin’ good time? Hop in the bed of the pickup truck and traverse the windy Appalachian roads on your way to the home of the Hillbilles Cashola. As the Palace of Chance featured game, this 20-payline slot has everything you’ll need to pass the time and earn some serious loot. Billy Bob, Billy Bubba and Billy Jo will serve as your hosts in this awesome slots adventure with a huge progressive jackpot. Get ready for a heapin’ helping of the white lightnin’ and maybe a little bit of Bubba’s famous road kill barbecue. If you’re not into eating opossum, feel free to skip over the appetizers and head straight for the main course: bankroll boosting wins! If you’re ready to get started, brush up on your hillbilly slang and prepare for an adventure. Hillbillies Cashola is available in two exciting play types. Take your pick between the time-saving instant play version and the super convenient downloadable version. This slot was developed by the trusted professionals at Realtime Gaming, so you can rest assured that both versions will work just as expected. 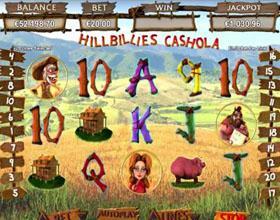 Looking for a little more info on those crazy hillbillies and their awesome slot? You’ve come to the right place! The controls in Hillbillies Cashola are easy to figure out, even for the most inexperienced players. Simply use the arrow controls to select your bet, and you’ll be ready to go. Your bet is separated into two portions: the number of paylines and the bet per line. This game offers up to 20 lucrative paylines for players looking to maximize their odds of winning on every turn of the reels. Remember, you’ll need to wager on a payline to collect the winnings from a combination, so selecting more lines is normally a good idea. After you’ve selected your number of lines, you can move on to the bet per line. If you want to know your total bet per spin, just multiply your bet per line by the number of lines you’re playing. Betting big is the best way to win big, so it can be a good idea to make the largest bet that your bankroll will allow. Once you’ve selected your bet, just click the spin button to get started. This button will turn the reels for a single game, allowing you to keep tabs on your winnings. If you’d prefer to let it fly, Hillbillies Cashola also features an autoplay feature that will keep the wheels spinning until you decide to stop them. This can really cut down on those unnecessary mouse clicks. When the Hillbillies throw a party, you’ll never be lonely. This slot features plenty of jovial, toothy companions to keep you company along the way. However, these characters aren’t just fun to look at, they’re also the game’s scatter symbols. If you’re unfamiliar with the terminology, scatter symbols are unique because they pay out in every direction, not just left to right. The more you land on a single spin, the better your payouts can be. 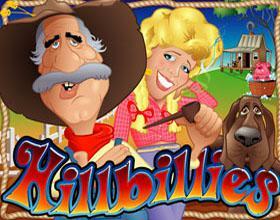 Hillbillies are also your ticket to Hillbillies Cashola’s awesome free games feature. Just land two or more Hillbillies anywhere during a regular game, and you’ll be rewarded with eight free games, on the house! If that’s not exciting enough, all prizes during these free games are doubled, and additional multipliers are mixed into the reels to give you a chance for huge winnings. Sometimes it pays to party with the Hillbillies, and this is one of those times! With a top award of 10,000 times your bet per line and a healthy supply of free bonus games, you may think that you’ve already hit the jackpot, but Hillbillies Cashola offers something even more appealing. This slot features a random progressive jackpot that can be awarded at the conclusion of any spin. Under every hubcap and hay bale, this slot has another way to line your pockets with the hillbillies’ gold. For the courageous adventurer, this is a great opportunity to maximize winnings while enjoying a visually-appealing slot. This exciting game drops you in the middle of a fully-functional hen house in pursuit of the valuable golden eggs. Featuring five reels, 25 paylines and two giant jackpots, there’s plenty of reasons to visit this farm during your time in the Palace of Chance. These hillbillies have made a fortune over the years, despite their lack of indoor plumbing. Even with the windfall, they prefer the simple things, which is good news for players of this slot. The hillbillies are giving away their cash, so grab a straw hat and strum your banjo. Let’s get the good times started! You don’t have to be a hillbilly to know the value of black gold. If you’re ready to try your hand at striking that world famous Texas Tea, this is the slot you’ll want to play. Take your pick from up to 25 paylines, and you could be on your way to free games and a huge progressive jackpot. Yeehaw! As a player at the Palace of Chance, you can count on a regularly updated library of the latest and greatest slots on the market. With our featured game program, we’re wading through the huge jackpots and bonus spins to pick out the best of the best for your enjoyment. Take a spin with Hillbillies Cashola this month, and you’ll be treated to a unique slot experience that’s unlike anything else on the market. The wins are probable, and the road kill is completely optional. What do you have to lose?